A collection of the best party music sung in funky costume or smart dinner dress, music that will keep you on the dance floor all night! Duffy, Jocelyn Brown, Diana Ross, Cher, Maroon 5 plus many others!! Add this onto the abalicious show or book as two full hours seperately. This is usually the chosen add on when booking Abalicious, again, this can be booked as 2 x 45's seperately as a Duo. Funky back to back disco and pure cheese from the 70s! Interactive and fun with big Afros or glitter all in ones! Hits such as heaven must be missing an angel to The bee gees! A duo capturing the best in soul Motown and 70s disco with sequin dresses and Motown moves! Bringing their experience of touring with the best soul and Motown bands in the U.K. They present this glittering show. Baby love, Dancing in the street, Respect, Stop in the name of love, Son of a preacher man, I'm every woman and many more ! Carla is an established touring artist and ex TV Celebrity with credits to her name including ITV's Popidol final 50, MTV Girl Band Finalist, BBC3, ITV2, My Kind of People, Rise TV, The Sun, The Mirror, The News of the World, Hola Spain Magazine, Spanish TV. Collaberations include with Big World Productions the Lucid Promotions Tour promoting her single "Its alright" alongside the Brookside Cast, charity single alongside Nick Bateman Big Brother Rik Waller and Jo Guest. Carla has also worked as support / alongside and performed for numerous celebrities including Vinne Jones, Claire Sweeny, Des o Connor, David Vanday, Bucks Fizz, Tony Hadley, cast of Corrie, TV's The Royal Family. 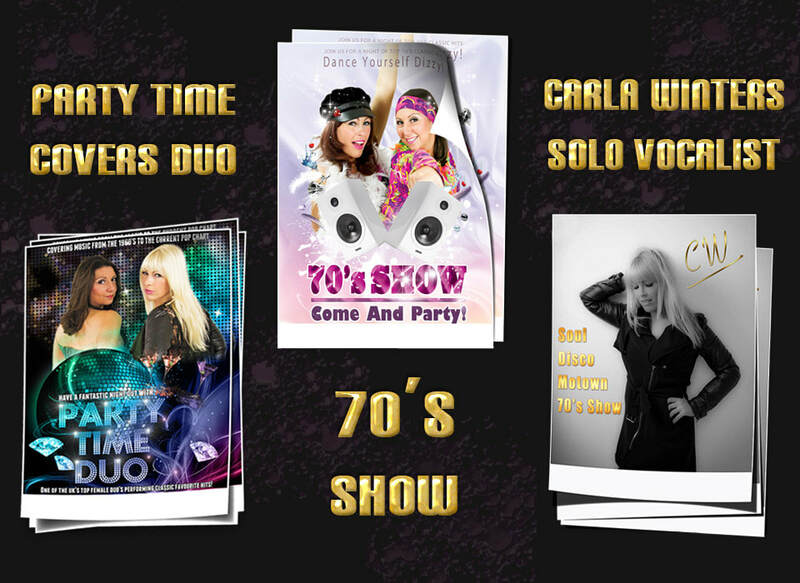 Carla has worked with some of the industrys best tribute shows and party bands including : Star, Souled Out, La Tour and The Choice. She's a radio presenter in Kent currently and still deps for many bands and her solo show includes the best hits from the 50s to present day however she specialises in 70s Soul and Motown perfect for any event large or small two sets or one. Tailored for you. Dinner dress or edgy attire. All shows can include sound engineer lighting also DJ we can hire in bigger PA and back drops plus dancers we also have contacts with caterers florists and wedding planners toast masters cake makers if needed please don't hesitate to ask there is no job too big or small for us.